GitHub - erictheise/trctr-pllr: A small application for randomly sampling locations from Census Tract population data. Want to be notified of new releases in erictheise/trctr-pllr? TRCTR-PLLR is a faker for United States location data. It's useful when you need point data that is representative of where people live as reported by the Census Bureau. For each requested observation, TRCTR-PLLR randomly selects a Census Tract using population-based weights. It then generates a location based on the bounding box of the Tract and tests to see if that point is contained by the Tract's actual boundaries. If not, it will generate and test up to 999 more locations. In the atypical case that none of the 1,000 generated points are contained in that Tract, it will randomly select a different Tract. This does introduce a bias that would be dubious in a tool that required statistical validity, but this is merely a faker. TRCTR-PLLR uses population data from the 2010 Census and Tract boundary data from 2018. 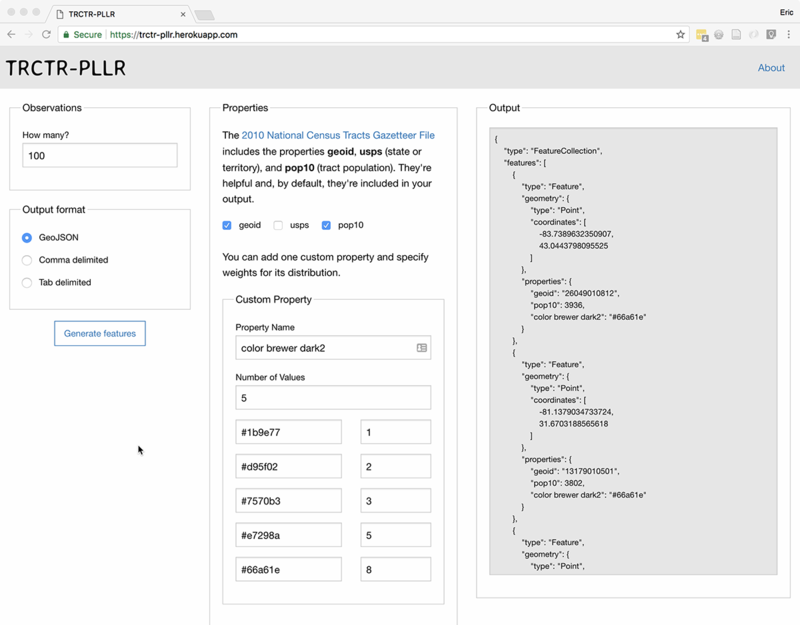 TRCTR-PLLR can return the Tract's geoip, usps, and pop10 from the original Census data and allows you to specify one additional property. I developed TRCTR-PLLR to prototype maps and used values of the additional property to set the fill color: how do 3 color, 6 color, 12 color maps render with 100 points, 1000 points, 10,000 points? I assume you have basic familiarity with the command line, with GitHub, and have a preferred package manager for your platform (e.g. homebrew for OS X). You'll need PostgreSQL with PostGIS extensions, but if you're doing geo work, you almost certainly already have these. You'll need Python 3 and you'll want a virtual environment manager such as venv. Everything else is installed via pip. download trctr_pllr.sql.bz2 and one of the source code archives from the release page. create a virtual environment and install the required libraries. copy the provided .env-example to .env, fill in your database credentials, make any other needed changes. create a database within psql or as you prefer. open your browser on http://localhost:5000 and fake it. when you're done, control-c the app and don't forget to deactivate the virtual environment. A hosted version of the application is presently available at heroku. select the number of observations you need. select the format of the output you need. if you'd like to generate an additional random property, e.g., color, click the Yes, please button. Name the property, specify the number of variants, then specify the values and weights of their occurrence. Weights are neither probabilities nor percents and do not need to sum to 1 or 100%. click the Generate features button. if you like the looks of the generated data, copy and paste the contents of the Output window into your own file. format: required. One of geojson, csv, tsv. geoid: optional. on to include Census Bureau Tract identifier in output. usps: optional. on to include two letter state or territory identifier in output. pop10: optional. on to include Census Bureau Tract population in output. customPropertyName: optional. URL-encoded string. Requires subsequent fields. customPropertyNumber: optional. Integer. Number of values the custom property may take. value-i: optional. URL-encoded string. i ∈ [0, customPropertyNumber). Custom property value to be surfaced in the output. weight-i: optional. Strictly positive number. i ∈ [0, customPropertyNumber). Proportion of the time the corresponding custom property value will be surfaced in the output. This little app works well enough for my purposes. I'm open to feedback, issue creation, pull requests. Thanks for your interest.